This quaint and historic location is a must see! The Vintage Cellar’s charming location is the original Rocky Hill School, which was built in 1902 and closed in 1977 making, what may be, one of the most memorable stops on the 290 Wine Trail. A new way to taste elegance, The Vintage Cellar offers wine tastings from Val Verde Vineyards, Perissos Vineyard and Bending Branch Winery and also features olive oil from Sandy Oaks and Quaglia Orchards. 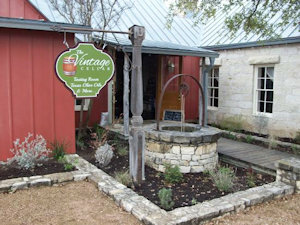 They’ve carefully selected the Texas Wineries and Olive Orchards featured because they are based in and around the Texas Hill Country. They carry only locally made wines and oils and offer assorted cheeses and meats, gourmet chocolates, locally made bread, pastries, and sweets to accompany them. Food pairings and boutique gift items, as well as locally made luxury and household items and gifts, are also available.